74180-9249 - Large Parts Bag. 74180-9259A - Small (hardware) Bag. 74180-9259 - Inner Bag W/fuse. 15 74210-5519 - Seat & Battery Belt Sets (2 Pcs. Ea.). 25 0801-0224 - 8 X 1inch Screw. 4 74180-9389 - Footboard Assm..
13 74180-2479 - Skid Plate. 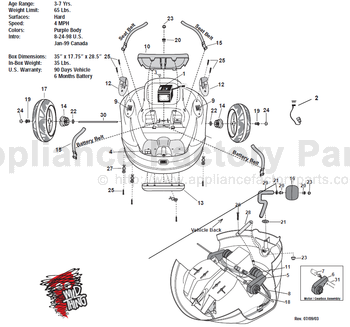 27 74550-2299 - Wire Harness Holder. 29 74180-4519 - Rear Pivot Axle. 30 74180-4509 - Main Axle. 74180-0310 - Main Decal Sheet. 23 0801-0604 - .354 Black Retainer/cap Nut. 16 74180-2469 - Rear Pivot Wheel.